After being told on Friday that they were going to try to keep Haly growing on the inside for at least another week, the plan changed on Saturday morning. The hospital needed me to meet 2 risk conditions to consider sooner induction. I had high blood pressure that was somewhat manageable with medications, but was still feeling awful, and was having a hard time sleeping because of all the extra fluid in my neck. By this time I almost couldn't walk because all the fluid in my legs and feet meant I almost couldn't bend my ankles or knees. On Saturday morning I reviewed my insulin usage and discovered that it had been cut in half for the previous 2 days... not a good sign. This is generally an indication that the placenta is starting to shut down and stop feeding the baby as it should. When Dr. de Regt came in to check on things that morning and found out about the insulin usage, she said we needed to start an induction in half an hour. I was moved across the hall from a smaller room to a labor and delivery room. The nurse started my IV with fluid, petocin, and magnesium at about noon. The contraction monitor started showing that I was having contractions, but I was unable to feel them. Every half hour they would dial up the petocin dose. Dr. de Regt came to check on me and suggested breaking my water at 7pm. Tom and I them started a movie, but about half an hour in my contractions were becoming pretty uncomfortable and I couldn't concentrate. Instead we went for a little walk. While it was probably helpful, it wasn't any more comfortable! Back in our room I spent the next few hours sitting in a big purple easy chair, working through the contractions as they got more intense. It helped to have a cheery nurse who was talking with Tom about people they both knew from school. Having something to listen to with my eyes closed seemed to make the time go by faster. Eventually I thought I couldn't handle the contractions any more and started trying to talk both myself and Tom into asking for an epidural. I didn't really want one because I knew it would be much healthier for Halcyone if I didn't get one, and the recovery would be better for me as well. I was under the impression from our birth class that if I didn't start getting sick and being unable to communicate or think well that I wasn't approaching the transition stage (8-10cm of 10 total). I wasn't feeling sick and I was still very able to answer questions and think through what I was doing, especially regaurding my insulin pump. (I opted to continue using my insulin pump instead of getting insulin through an IV for labor because I was more confident in my ability to control my blood sugar than someone who doesn't live with diabetes every day.) I thought this meant that I was no where near the peak of what the pain could be. The nurse checked my cervix and said I was at about 8cm. Tom suggested using a small amount of narcotic instead of an epidural. This worked enough to very slightly dull the pain that I didn't feel quite like I was dying every 2 minutes. Up to this point Tom had been reminding me or checking my blood sugar every hour. So far things were going really well. My numbers were staying around 90-110. I kept cutting back my insulin rate each hour as well and was being allowed to drink juice if I felt like the number was falling too quickly. I had also been allowed to eat lunch and drink a Jamba Juice that afternoon, something I had been told would likely not happen. Apparently doctors don't like it when you have that much food in your stomach. I knew I wanted to eat because I would need the energy. The doctor told us that labor burns 1000 calories an hour and is comparable to running a marathon! It was probably less than an hour to get from 8 to 10cm, but the last bit was hard to get through because it felt like I needed to push Haly out already. About 2am Sunday morning the nurse verified that I'd reached 10cm, they wheeled me to the operating room where Dr. de Regt was waiting. Apparently it is hospital policy that anyone at 35 weeks of gestational age or less has to deliver in the OR. They would have more room for Haly's team of doctors to evaluate her and be in the right location if at any point she became stressed and needed to be delivered via c-section. The OR was so cold and bright compared to the labor and delivery room... 63 degrees! The nurse told me they keep it that cold to keep germs from growing. After slightly more than 2 hours of pushing Halcyone arrived! Her heartrate never got unhappy during pushing, something that seemed to surprise the doctor. 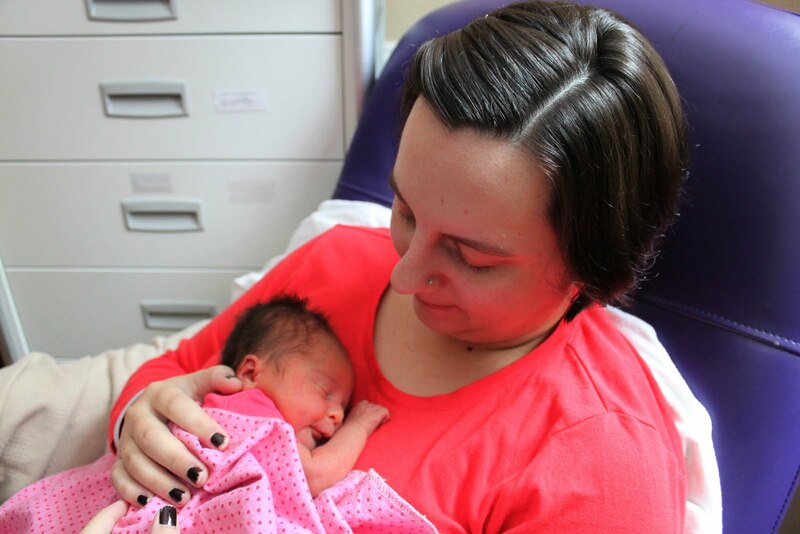 The doctor let me hold her for a minute before her team of NICU help took her across the room for evaluation. Her APGAR score was initially an 8, but went up to a 9 at 5 minutes. 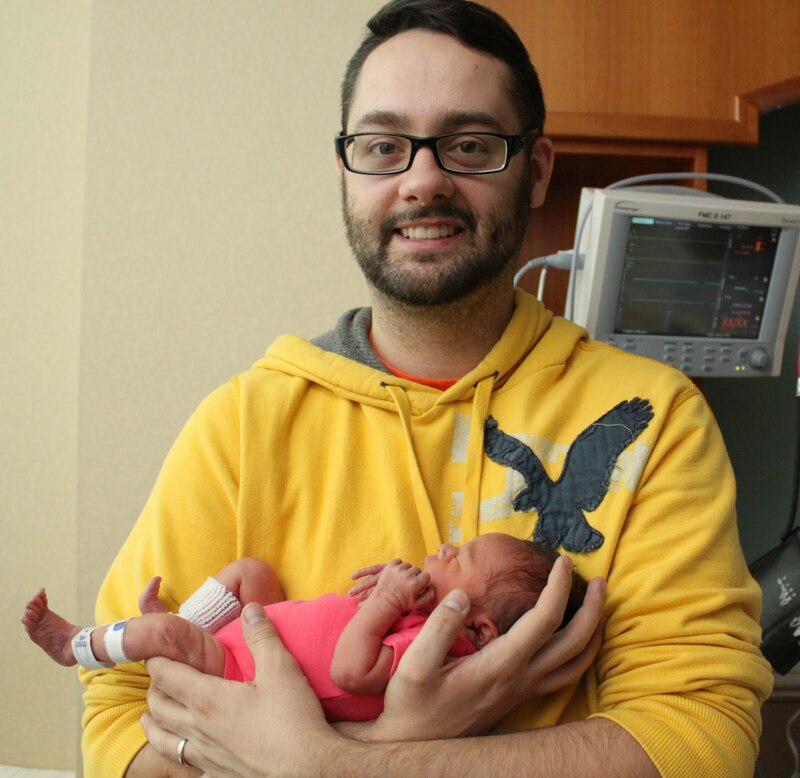 The doctors were expecting her to need oxygen or some other sort of continued NICU care for a few weeks because she arrived 5 weeks early, but she didn't! Tom went up to NICU with Haly for her required 4 hour evaluation. He fed her a couple bottles, talked with her, and helped her get her blood sugar and PKU checks. 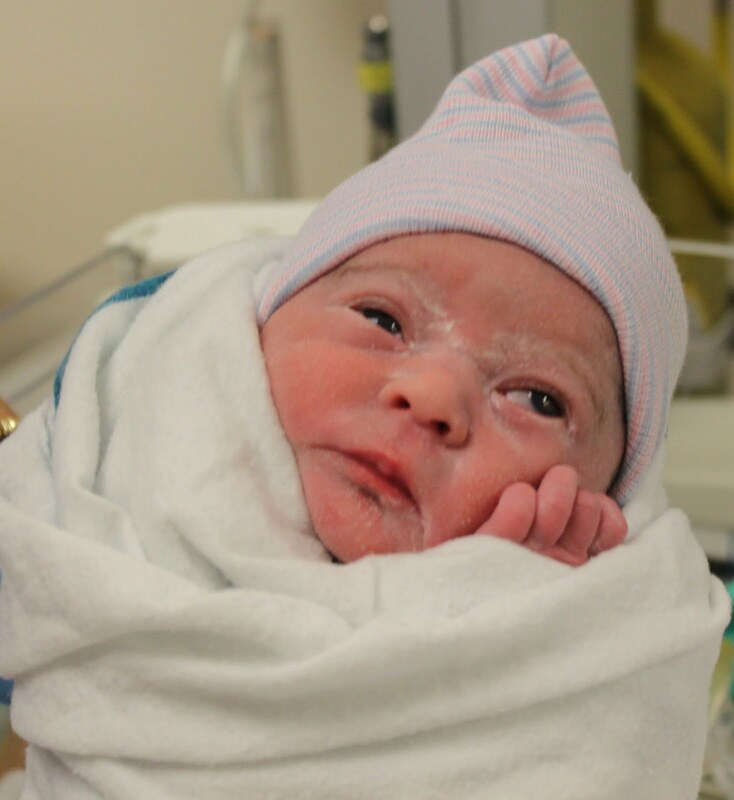 My doctor stitched me up and finally got my bleeding to slow down, then sent me back to my labor and delivery room. Our doula stayed with me until my mom arrived. I slept for about 50 minutes. Tom got to come back down to our room with Halcyone after 4 and a half hours. When he gave her to me she smiled when she heard my voice and we finally got a nice snuggle. I had to stay on my petocin and magnesium IV for another 24 hours to control my blood pressure. It seemed to have stabilized, so I was discharged on Tuesday. By Friday my blood pressure was running high again, so a visit to my doctor was in order. She prescribed more medications and said to call in over the weekend if it didn't get better. Haly's blood work showed that she had a high bilirubin level on Monday, so we ended up in the pediatric unit with her under the bili lights for about 30 hours. It was so hard to see her sad and crying but not be allowed to pick her up. We discovered she's a baby who loves to be held and suggled with. We got to take her out for about 20 minutes of feeding time every 3 hours.Haly got to leave the bili lights at 2am on Wednesday. She had a follow up blood test that allowed her to be discharged around noon on Wednesday. Along the way they discovered that one of her neutrophil/white blood cell count was super low. This meant that she was at high risk of infection. A follow-up blood test on Thursday showed that these cells had tripled. She's still pretty susceptible to bacterial infections, but at least getting better at fighting them! We had to borrow a friend's car seat that can safely hold a smaller baby than ours, but Haly passed her car seat test and we were on our way home! It's been so nice to be at home! I realized that yesterday was the first day I've driven or made dinner in a long time! It feels so good to not be on bedrest anymore. We're both loving taking care of Haly and spending lots of time cuddling her. We thank God for her health and life all the time. She's just perfect for our family. Awesome! So glad you were able to do it naturally! I'm proud of you! Sounds like you did amazing! What a blessing she is. I thank God for her too, and I know you guys are amazing parents already! Wow! Congratulations and thanks for sharing your story! 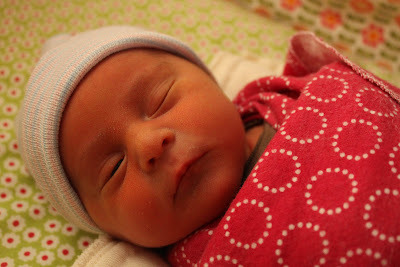 I am amazed that you didn't end up in the NICU for longer than four hours; that is wonderful! 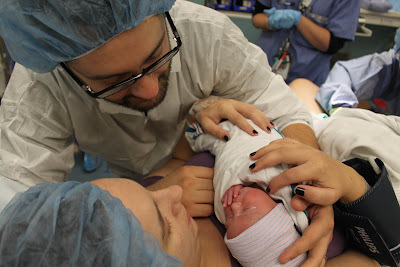 I love birth stories - thanks for sharing! Congratulations to you and Tom!!! I know you've prayed and waited a long time for this, and it's so exciting that Haly's finally here and doing so very well!